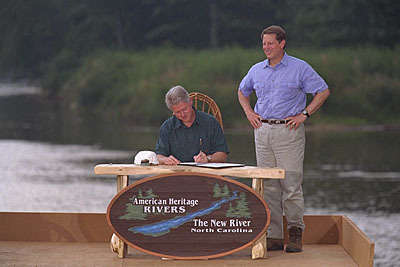 Today, President Clinton and Vice President Gore travel to the New River in North Carolina to designate 14 American Heritage Rivers. Communities along these rivers --from New York's Hudson, to the mighty Mississippi, to Hawaii's Hanalei --will receive help over the next five years tapping federal resources to carry out their plans for revitalizing their rivers and riverfronts. This initiative reflects the Administration's strong commitment to building partnerships that promote prosperity while protecting our environment. Local Rivers, Local Plans. More than 3 million miles of rivers and streams flow across America, nourishing our soil, carrying our commerce, sustaining our wildlife and quenching our thirst. The American Heritage Rivers initiative, announced by the President in his 1997 State of the Union address, recognizes and rewards voluntary community-based efforts to restore and protect the environmental, economic, cultural and historic values of our rivers. It encourages communities to come together around their rivers and develop strategies to preserve them for future generations. An Outpouring of Grassroots Support. Following the President's call for nominations, the Administration received 126 applications from communities in 46 states and the District of Columbia asking that their rivers be designated an American Heritage River. Each included a detailed action plan describing the communities' vision for protecting natural resources, promoting economic revitalization, and preserving cultural heritage. Twenty-one governors, and more than 200 members of Congress and 500 mayors, wrote in support of the initiative. Helping Communities Fulfill their Visions. For each American Heritage River, a federal employee will be named as a "river navigator" to help communities identify existing federal programs and resources that can help in carrying out their plans. The "river navigator," selected in consultation with the community, will be in place within three to six months and will serve for up to five years. Federal assistance could include economic development or pollution cleanup funds, and will be provided only at a community's request. Blackstone and Woonasquatucket Rivers (MA, RI) -These rivers, flowing through Worcester, Providence and 24 other communities, reflect the history of New England from agrarian to early industrial and modern times. Connecticut River (CT, MA, NH, VT) -Flowing 410 miles from the Canadian border to the Connecticut coast, the river passes through New England's great Northern Forest, 99 cities and towns, and some of the nation's best preserved wetlands. Cuyahoga River (OH) -Once so polluted it caught on fire, the 100-mile-long Cuyahoga became a stark symbol of the plight of America's rivers and a rallying point for passage of the Clean Water Act, one of the nation's landmark environmental laws. Detroit River (MI) -The 32-mile-long river, once a "roadway" for early settlers and slaves fleeing the South, today serves more than 5 million people with drinking water, recreation and cultural opportunities, and is the largest port in the Great Lakes. Hanalei River (HI) -Starting high on the slopes of Mt. Waialeale on the island of Kauai, one of the wettest spots on Earth, the river flows 16 miles through a lush valley rich in wildlife and traditional culture, emptying into Hanalei Bay. Hudson River (NY) -The first great river encountered by European settlers, the Hudson flows 315 miles from the Adirondack Mountains to New York Harbor, and played a central role in the early commercial, military and cultural history of the United States. Upper Mississippi River (IL, IA, MN, MO, WI) -Perhaps the most renowned of America's great rivers, the Mississippi remains a key economic link through America's heartland. This designation encompasses 58 communities from St. Louis to St. Paul. Lower Mississippi River (LA, TN) -The lower Mississippi supports rich farmland, extensive wetlands and the largest port complex in the world. This designation covers the stretches through Memphis and from Baton Rouge to New Orleans. New River (NC, VA, WV) -The oldest river in North America, the New originates in the Blue Ridge Mountains and flows north for 250 miles through rolling hills and farmland to the steep gorges of West Virginia's coal country. Potomac River (DC, MD, PA, VA, WV) -Rich in history, the Potomac basin holds the earliest evidence of inhabited structures in North America, was a boundary between North and South in the Civil War, and is home to our nation's seat of government. Rio Grande (TX) -Flowing from Colorado to the Gulf of Mexico, through one of the country's fastest-growing regions, the Rio Grande forms the border between Mexico and the United States. The designation covers the cities of El Paso, Laredo and Brownsville. St. Johns River (FL) -Beginning as a broad marsh south of Cape Canaveral, the St. Johns flows 310 miles to Jacksonville, dropping only 30 feet along the way, making it one of the laziest rivers in the world. Upper Susquehanna and Lackawanna Rivers (PA) -These rivers flow through scenic valleys in northeastern Pennsylvania, where coal mines helped fuel America's industrial growth, but left a legacy of pollution that communities are now working to reverse. Willamette River (OR) -Flowing 187 miles from the Cascade Mountains to the Pacific Ocean, the Willamette was the final destination of pioneers on the Oregon Trail, and remains central to the state's economy. The designation runs from Portland to Springfield.